These monthly sessions include training on a specific marketing/business topic, time to network and a powerful mastermind session where you get several other business women helping you solve a business issue you have. May’s topic – How to create engaging and interesting social media content – so you can boost your profile, gain more likes and followers, build the know, like and trust factor and ultimately gain more clients. – get help and support from other savvy business owners and help them too, while learning even more! You will walk away from each session having made solid progress with your business in a supportive environment, with some clear tasks to be actioned to get you achieve your goals. I attended the Beat Procrastination Workshop and found it well structured, informative and friendly. I learned some useful tips and methods to enable me to ‘just get on with it!’ and I liked the way it was fun and light hearted at times, but sensible and informative too. It was an enjoyable morning and I will be attending more in the future. Following introductions (a chance to practice your ‘pitch’), you’ll receive expert marketing training and mentoring from me, on this month’s topic (see below), then after a networking tea break you’ll create small groups to mastermind (brainstorm and get support with) a specific issue you have in your business at the time – and have me on hand to help too. You’ll then set effective goals and tasks for the next month and get an accountability buddy. 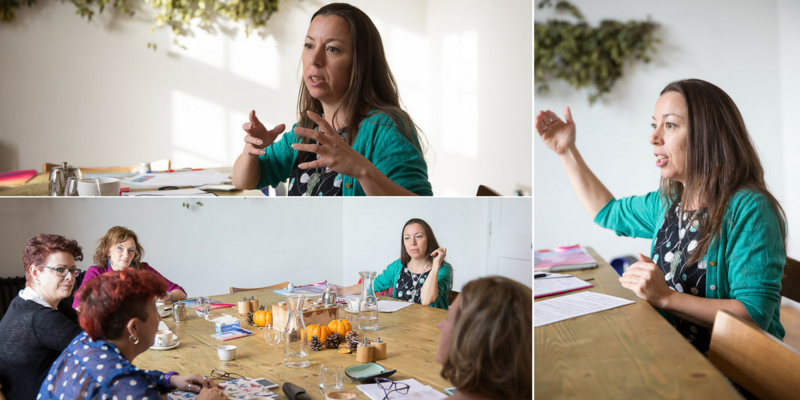 MAY’S MASTERCLASS TOPIC – How to create engaging and interesting social media content – so your posts are seen by more people and are more effective. It’s so hard these days to get your social media posts seen by your audience (followers etc), let alone have them engage! Social media is I think essential to any small business owner when used well. Don’t let your time and effort on social media go to waste – come to learn how to share content on social media that attracts your audience to you and to buy from you. I have been to the Goals setting and Procrastination workshops which were brilliant. I came away with lots of useful tips, spreadsheets and other information to help me get the most out of my time. I found Hils to be very insightful and full of empathy. I also met some very interesting women and will definitely be attending more of her events and have just booked a 90 minute consultation. Includes tea/coffee and sweet treats. * £10 discount on all prices available to members of my Facebook group: The Courageous Business Women’s Collective – join here to get the discount code, from the info on Events file in the ‘files’ tab. Click the BOOK NOW button to book tickets on Eventbrite. NB: Please arrive at 10am (when the cafe opens) for a 10.15 prompt start. If you have any questions, please get in touch with me here. My marketing training & coaching is all about helping you do business more confidently, authentically and effectively; whether that is putting yourself out there, writing your copy, doing video, pricing your services, setting goals, mastering fear or beating procrastination and getting better at time management. These sessions will support you both personally and professionally.